In order of elevation from highest to lowest, the next Great Plains state high point is Harney Peak in South Dakota (7,242 feet above sea level). It’s possible I have mentioned all of this before in the blog, so apologies if I’m repeating myself here, but I first want to go on record as stating that I am particularly fond of Harney Peak as it is the closest real mountain to where I grew up (Minnesota). As a lifetime “peakbagger,” this is important information to me. Harney Peak is near and dear to my heart as it stands above all else in the wonderful state of South Dakota! Having said all of that, my only point of contention is not with the peak itself – How could anyone ever have a point of contention with any mountain? – but with the claim that it is the highest point east of the Rocky Mountains. This is simply not true. First – the Black Hills are geologically closely related to the Rocky Mountains, and therefore are not really east of them, but part of them. Second – the phrase “east of the Rocky Mountains” is vague. Presumably, it does not include the Himalayas, which are east of the Rocky Mountains, so what does it include? The United States only? OK, there is a peak in Texas called Emory Peak, which is in Big Bend National Park. Emory Peak is actually east of Harney Peak (just barely) and stands about 600 feet higher at 7,825 feet. However, you could argue that Emory Peak is actually south of the Rocky Mountains as well as east, and that would be true enough. So is there a peak that is east of the Rockies, in the United States, and higher than Harney? Yes – quite a few actually. In fact, there are dozens and dozens of peaks and summits higher than Harney in the volcanic region known as the Raton Mesa in southeastern Colorado and northeastern New Mexico. 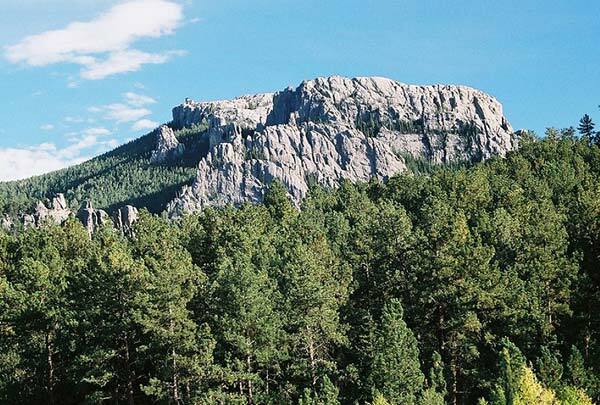 There are also the Pinon Hills in northeastern New Mexico which boast several summits significantly higher than Harney Peak. These areas are not related geologically to the Rocky Mountains, but are of a volcanic origin, and the higher reaches of these areas have been protected by a thick layer of lava which has resisted erosion. One of these peaks is Capulin Volcano (8,182 feet), and I add the link here because the National Monument has good information about the area in general. The highest peak in this region is Fishers Peak just outside the city of Trinidad, Colorado, which stands at a whopping 9,655 feet – more than 2,400 feet higher than Harney Peak! Once again, I love Harney Peak. I have climbed it many times, and I would jump at the chance to do it again, but it is simply not the “highest point east of the Rocky Mountains.” It is, however, the indisputable high point of South Dakota, and the Great Plains Trail will run right by it when the routing is completed. Carry on Harney Peak! Stand tall! You’re still well loved! This entry was posted in Uncategorized and tagged black hills, capulin national monument, emory peak, harney peak, highest point east of the rockies, highest point east of the rocky mountains, pinon hills, raton mesa, south dakota. Bookmark the permalink. Harney Peak and the Black Hills are not geologically related to the Rocky Mountains. The Black Hills were an old Mountain range when the Rockies were forming. As I grew up in the shadows of Harney Peak we always said it is the highest point east of the Rockies, and west of the Alps. Admittedly, the geology of the Black Hills is complicated, but most things I’ve read point to a distinct correlation between the Black Hills and the Rockies, but they certainly are unique. There are quite a few ranges in Europe that are west of the Alps that have peaks higher than Harney, even if you stay at roughly the same latitude. The Pyrenees in France/Spain have 11,000 foot peaks. The Cantabrian Mountains of Spain have peaks over 8,000 feet, and there is a volcano in the Azores in the middle of the Atlantic Ocean that is about 7,700 feet. As I said, I love Harney Peak and the Black Hills as much as anyone, but its only true claim is that it’s the highest point in South Dakota, which is awesome!